This page covers three artists. The first is Chris Martin, the person. He's the lead singer of the band Coldplay. Coldplay While studying at University College London, Martin met Jonny Buckland, Will Champion and Guy Berryman. In 1997, they formed the rock band Coldplay. The band has had internationally recognized fame and success since their debut album, Parachutes, in 2000. Since then, they have released three further albums: A Rush of Blood to the Head, X&Y and Viva la Vida or Death and All His Friends. Solo work As a solo artist, Martin has written songs for a variety of acts including Embrace ("Gravity") and Jamelia ("See It in a Boy's Eyes"). Martin has also collaborated with Ron Sexsmith, Faultline, The Streets, and Ian McCulloch. He also sang a part of the vocals for the Band Aid 20 single, "Do They Know It's Christmas?" at the end of 2004. In 2005, Martin collaborated with Nelly Furtado on the track "All Good Things (Come to an End)", for her 2006 album, Loose. The two were once rumoured to be a couple, after they both performed at Glastonbury in 2002. Furtado joked about the situation, saying that "Yeah, he's my boyfriend — he just doesn't know it yet". Martin's fascination with hip hop was shown in the summer of 2006 when he collaborated with rapper Jay-Z for the rapper's comeback album Kingdom Come after the two met earlier in the year. Martin put some chords together for a song known as "Beach Chair" and sent them to Jay-Z who enlisted the help of hip hop producer Dr. Dre to add the drum line to complete the track. The song was performed on 27 September 2006 by the two during Jay-Z's European tour at Royal Albert Hall. In 2007, Martin appeared on a track titled "Part of the Plan" for Swizz Beatz' debut solo album One Man Band Man. Martin has also worked on a solo collaboration with Kanye West, with whom he shared an impromptu jam session during a 2006 concert at Abbey Road Studios. He performed the chorus on "Homecoming", the fifth single from West's third album, Graduation. The second is a 2 piece experimental/ instrumental band located in Derby, UK, Chris Martin are a very loud experimental rock band. They broke up in 2006 but recently reformed in 2010 check em out... www.myspace.com/thisischrismartin The third Chris Martin is an electronic musician from Miami, Florida. 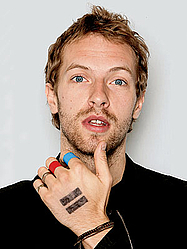 Subscribe to Chris Martin RSS Feed to get latest lyrics and news updates. What do you think about Chris Martin? Let us know in the comments below!